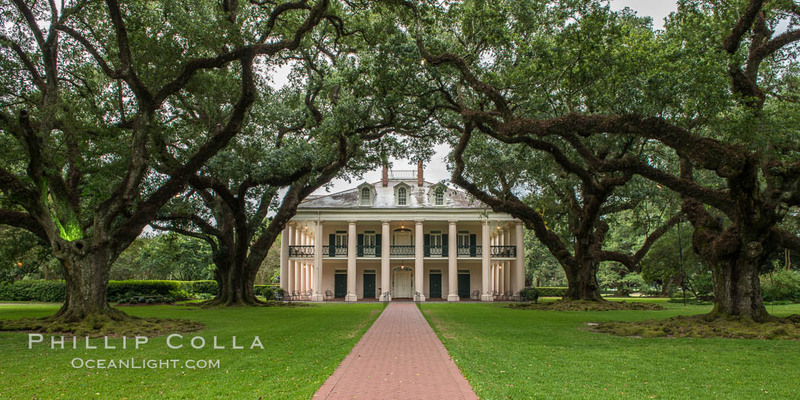 While in New Orleans recently, I made a side-trip to visit Oak Alley Plantation. 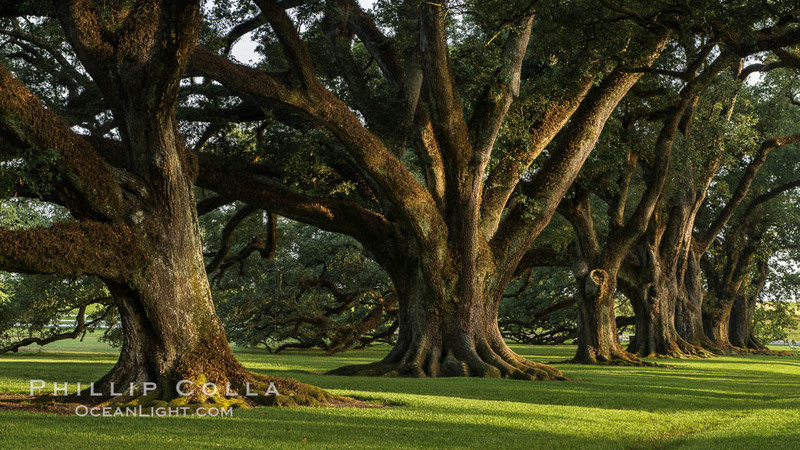 I love ancient, huge and gnarly trees, and when it comes to oak trees — specifically the southern live oak, Quercus virginiana — Oak Alley Plantation has some of the most photogenic in the South. 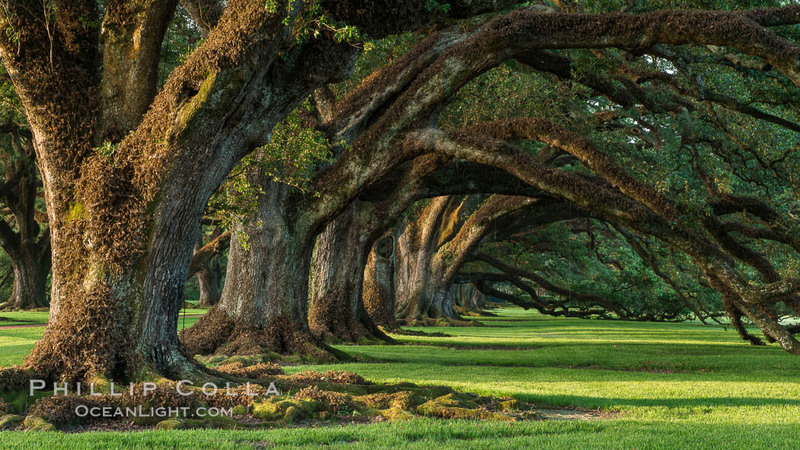 My goal was to produce one or two very large prints — 6 to 7 feet long — of the trees that grace this plantation, hopefully for hanging in our dining room. This required waiting for good light with no people around and shooting multi-image high resolution panoramic photographs, a slow process. 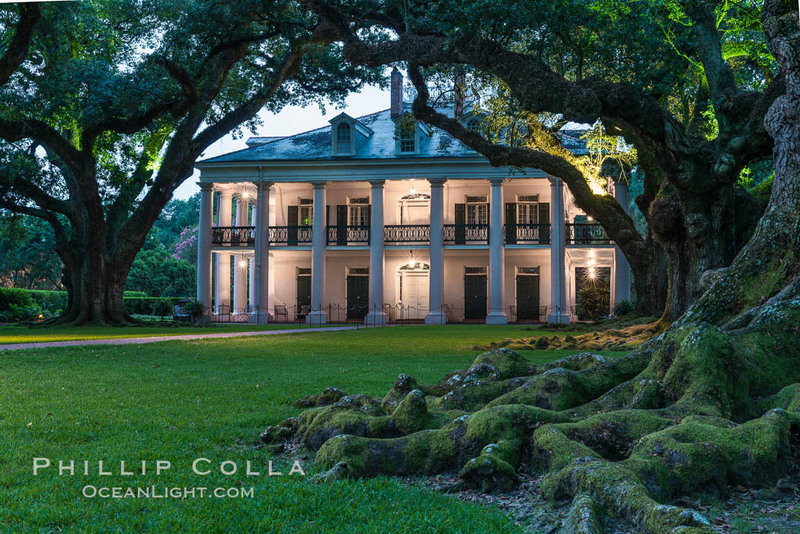 The plantation’s most captivating view is that of its stately Antebellum mansion framed by the canopied tunnel of enormous trees, and that is where I spent most of my time. The double row of southern live oaks in this view was planted in the early 18th century, well before the house itself was built, and now forms a remarkable path between the house and the Mississippi River. The river itself can no longer be seen due to the the levee at its edge, but the effect is still stunning. Could the person who planted the trees 300 years ago have known what a perfectly balanced and imposing instance of deciduous wonder they would one day become, centuries hence? That would have been foresight indeed. 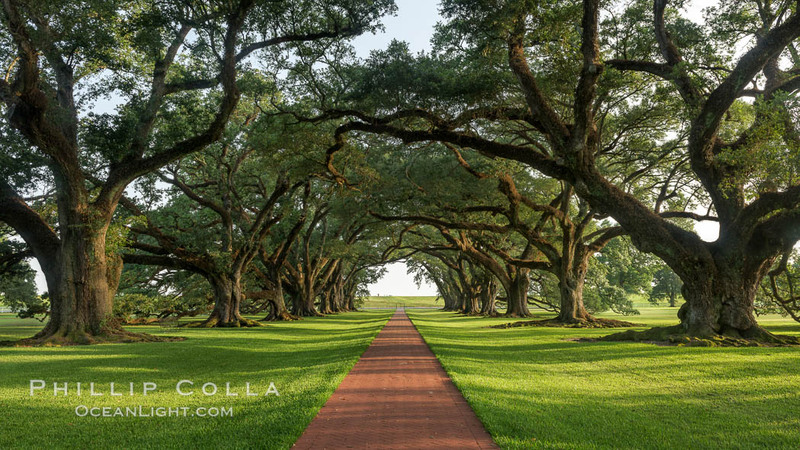 Oak Alley Plantation receives hundreds of visitors each day, so I opted to avoid the crowds and shoot at sunrise and sunset. I lucked out and got both types of light I was hoping for: overcast skies and muted, soft, flat light at dusk, and fairly clear skies and warm side lighting at dawn. I was alone for some hours walking the grounds in peace and quiet, checking out the stately mansion and its varied barns, cottages, gardens and out-buildings in addition to the many huge old oaks spread across the plantation. After sunset the sound of what I am guessing were cicadas buzzed everywhere and continued through the night. 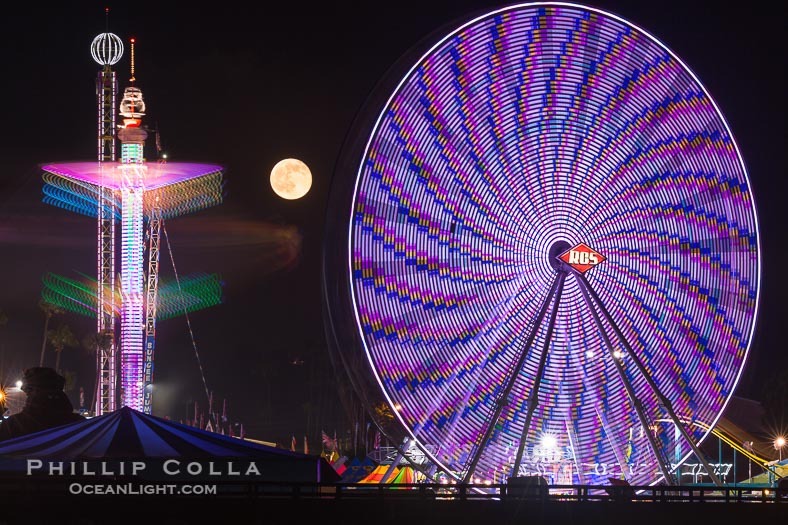 Once all hint of color had left the evening sky, I returned to my cottage and enjoyed the meal of gumbo, etouffee and grits that the kitchen staff had left for me in the fridge. I was tempted to walk around again as the moon had risen and I knew the movie Interview with a Vampire had been filmed here so there must be some kind of evening spirits inhabiting the property, but jet lag caught up with me so I set my alarm for 30 minutes before sunrise and crashed for the night. The following morning the overcast skies had lifted so I knew there would be some side lighting on the trees. It is fortunate I rose early, since the first thing that happened when I stepped outside into the heavy, wet, warm morning air was to completely fog every surface of my camera. After many years of diving with cameras in the tropics I should have known better than to take a cold camera out into a warm humid place. After 20-30 minutes the camera fog had cleared and I could shoot properly, and I set about photographing the panorama that I had planned for just as the sun crested the horizon and shed warm, diffuse Louisiana light on the oaks. Around 7:30 I had to leave, needing to be back in downtown New Orleans by 9am. The light and conditions had been just perfect and I lucked out on this one. I was hoping to be captivated by the place — by the trees especially — and I was not disappointed. 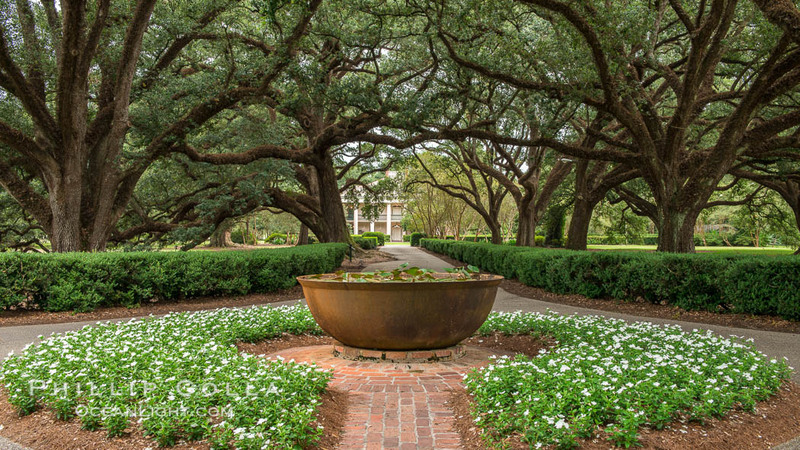 If I sound romantic it is with good reason since Oak Alley is indeed a romantic place, evoking the grace, decadence and elegance of the Old South. Will I return? Absolutely. The next time I am in New Orleans it will be the first thing I put on my calendar.